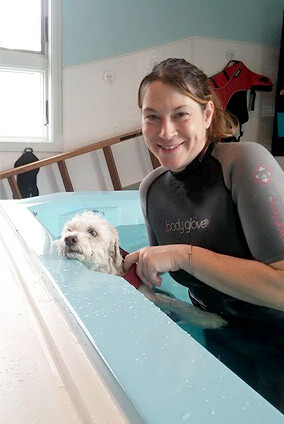 As one of Animotion Animal Rehabilitation Center's canine rehabilitation practitioner, Wendy Whitelaw adapts human physical therapy techniques to increase function and mobility of dogs' joints and muscles to reduce pain and enhance recovery from injury, surgery, degenerative diseases, age-related diseases and obesity. She is motivated by her commitment to improve the quality of life and decrease pain for the pets in our care. Wendy earned her bachelor's degree from the University of Rhode Island and received her canine rehabilitation certification from the University of Tennessee. She joined our hospital in March 2003 and was a veterinary technician prior to training in canine rehabilitation. "I have been given many opportunities to learn and excel at Animotion Animal Rehabilitation Center," she says. "I love the flexibility that my job allows me with a young family at home. The management, the doctors and the staff are all very nice and so are the clients." When not at the hospital, Wendy enjoys running and spending time with her family and friends. She has two English bulldogs named Duke and Caesar and two cats named Dixie and Turtle. Laurien is the part-time rehabilitation practitioner of Lloyd Animal Hospital. She's been working in the animal field for over 13 years, ranging from veterinarian in South Africa to owner of a veterinary behavior clinic. She administers the proper rehabilitation for our patients following an injury or surgery, completes physical therapy for dogs that are struggling with arthritis and obesity, and assists dogs who need conditioning. Some of Laurien's favorite parts of her job are seeing progress made due to a therapy program and getting to know both the patients and the clients as the pets positively progress. Her history in veterinary care includes a Bachelor's Degree of Veterinary Science (BVSc) from her schooling in South Africa. She is currently working as a veterinary technician in the rehabilitation field while undergoing her certification exams to practice as a veterinarian in the United States. At home, Laurien has two Boston Terriers, Charlie and Rhubarb. She thoroughly enjoys training dogs and used to run a puppy socialization school! When Laurien's not at work, she loves reading, cooking, running, the theatre, and exploring new places. She also has three sons that keep her busy! Laurien loves spending time with friends and family and is involved in a number of community outreach projects. Renee is a Certified Canine Rehabilitation Practitioner. She loves getting to know each animal individually while providing our clients rehabilitation services. Renee has a BS in Physical Therapy and utilizes skills developed working with people in a variety of clinical settings. She takes great pride in having the opportunity to improve our clients lives and bring such joy to their owners as they improve and meet their goals. In her free time, Renee enjoys skiing, traveling, cooking, and watching her kids play hockey. Renee has two dogs (Finneas & Fitzgerald), a bearded dragon named Spike, and a fish named Big Papi. April Rivers has over 9 years of experience in veterinary medicine, and has been part of the Animotion Animal Rehabilitation Center team for about eight years. She wears many hats, with responsibilities ranging from phlebotomy and triage, to assisting our veterinarians and aiding our canine patients during rehabilitation. April is also certified in both laser therapy and stem cell processing. A lover of travel and shopping, April shares her home with two feline friends, Ping and Oliver. Christina Campbell joined Animotion Animal Rehabilitation Center in October 2014, bringing 15 years of experience in animal care. Her responsibilities include assisting our veterinarians with therapy and with client education. "It's really nice to enjoy what you do and the people you do it with every day," she says. "The staff and doctors are very welcoming; there is a family vibe here which is great." Nancy joined the Animotion Animal Rehabilitation Center team with 14 years of experience as a veterinary technician. Because of her experience at both an emergency hospital and a general practice, Nancy is able to "share veterinary knowledge from all different aspects of care." She most enjoys greeting our clients and their pets. Sharon is one of the first people to greet you upon entering Animotion Animal Rehabilitation Center. As a receptionist, Sharon schedules appointments, answers phones, checks patients in and out, and helps keep our practice organized and running smoothly. She loves meeting new patients, and watching old patients progress and improve. Sharon has 6.5 years of experience in the animal care field prior to joining our team in March of 2017. She finds the level of compassion and care during the recovery process within our rehabilitation center extremely rewarding. When she isn’t working, Sharon loves entertaining, cooking, and baking for family and friends. Some of her hobbies include road trips, exploring new areas, beach visits regardless of the season, and rooting on the Bruins, Red Sox! Sharon also cares for two dogs of her own, a West Highland Terrier named Lily and Cairn Terrier named Gunner. Monika is our full-time customer service representative here at Lloyd Animal Hospital and joined our team in June 2018. She assists our clients in scheduling appointments, answering emails and calls, processes payments, and answers any questions or concerns that they may have for their pets. She thoroughly enjoys working with all our clients and their wonderful pets. "I love working here because we're like a close knit family," Monika says. "My coworkers and I work well together and all the medical staff care deeply for the pets they care for." Monika has two chocolate labs at home — Tedi, who's 12-years-old, and Romeo, who's height-years-old. In her free time, she enjoys bowling, going to the beach, taking long drives, going out to eat, and spending time with family and friends.